Wind business data, trends and insights, including installed and pipeline capacity, supplier market shares and project development performance. 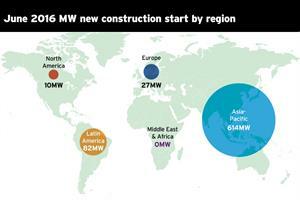 WORLDWIDE: New construction starts were down by two-thirds by MW in July 2016 compared to the same period in 2015. 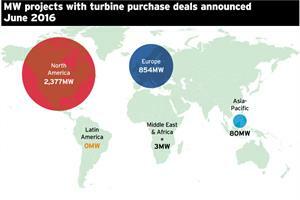 WORLDWIDE: The first half of 2016 ended with its highest monthly total of turbine deals, with 3.3GW of new purchases agreed during June. 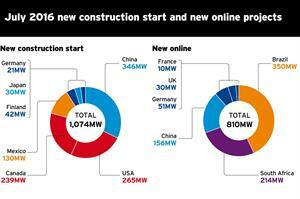 WORLDWIDE: New online capacity in June 2016 was a third of the total from a year earlier as new construction starts also halved, according to Windpower Intelligence. WORLDWIDE: The capacity of turbine deals in a single month has fallen to its lowest amount since March 2016, figures from Windpower Intelligence, the research and data division of Windpower Monthly. WORLDWIDE: The monthly capacity of turbine deals in July 2016 was down 17% on the previous year as the European market halved, on the back of an offshore slowdown. WORLDWIDE: The capacity of projects to begin construction has decreased year on year by 10%, as new online capacity falls 38% in megawatt terms. 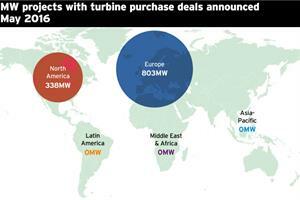 WORLDWIDE: The total MW of turbine deals in April 2016 was the highest monthly total since June 2015, according to data gathered by Windpower Intelligence, the research and data division of Windpower Monthly. WORLDWIDE: Activity worldwide has increased year-on-year for the first time since December, the latest figures from Windpower Intelligence shows. WORLDWIDE: Some of the world's biggest turbine manufacturers are limping back to health with a vote of confidence from the stock markets, according Windpower Monthly's Windicator. Although 3GW of new capacity has been added since our last report, there are now signs of a slowdown in the rate of worldwide growth. The wind power industry's miserable start to 2010 continued into the second quarter as a slew of weak earnings figures meant that stocks continued to haemorrhage value. Global wind power capacity will more than treble to 58,000 MW within five years -- and it will increase to 145,000 MW by 2010. The projection for the decade represents an eightfold growth in capacity, but even then wind will only provide 1.78% of the predicted world electric energy output in ten years' time. These are just some of the many conclusions reached by Danish company BTM Consult in its latest World Market Update, the fifth in an annual series on international wind energy development.